My favorite wonder of the ancient world. 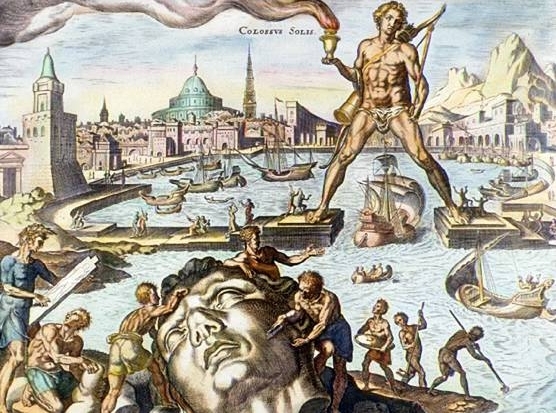 The Colossus of Rhodes was a statue of the Greek god Helios, erected on the Greek island of Rhodes by Chares of Lindos between 292 and 280 BC. Ancient accounts, which differ to some degree, describe the structure as being built with iron tie bars to which brass plates were fixed to form the skin. The interior of the structure, which stood on a 15 meters (50 ft) high white marble pedestal near the Mandraki harbor entrance, was then filled with stone blocks as construction progressed. The base pedestal was at least 60 feet (18 m) in diameter and either circular or octagonal. The feet were carved in stone and covered with thin bronze plates riveted together. Eight forged iron bars set in a radiating horizontal position formed the ankles and turned up to follow the lines of the legs while becoming progressively smaller. The lower plates were 1-inch (25 mm) in thickness to the knee and 3/4 inch thick from knee to abdomen, while the upper plates were 1/4 to 1/2 inch thick except where additional strength was required at joints such as the shoulder, neck, etc. The legs would need to be filled at least to the knees with stones for stability. Accounts described earthen mounds used to aid construction; however, to reach the top of the statue would have required a mound 300 feet (91 m) in diameter, which exceeded the available land area, so modern engineers have proposed that the abandoned siege towers stripped down would have made efficient scaffolding. The statue stood for only 56 years until Rhodes was hit by an earthquake in 226 BC. The statue snapped at the knees and fell over on to the land.